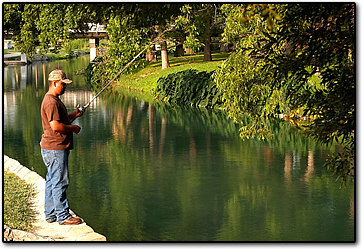 Del Rio's original name was San Felipe del Rio (Saint Phillip of the River). The name was given to the area by some early Spanish missionaries who arrived here on St. Phillips's Day in 1635. Their mission was destroyed by hostile Indians, but the name survived until 1883, when the first post office was established. The Post Office Department suggested shortening the name to Del Rio to avoid confusion with the town of San Felipe de Austin, a town still in existence, four hours east of Del Rio by car. There is ample evidence to suggest the presence of Indians in this area as long as 10,000 years ago. Val Verde County has one of the richest concentrations of aboriginal art on the continent. 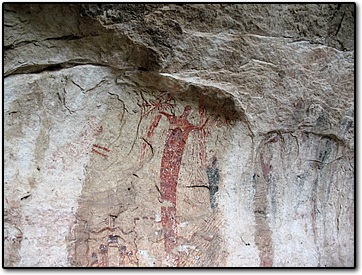 Pictographs are painted on the walls of many caves and date back some 4,000 years before the birth of Christ. The county has some 400 archaeological sites, including caves, rock shelters and mounds. Panther Cave, in Seminole Canyon on the Rio Grande River, contains some of the most striking pictographs and can be reached by boat on Lake Amistad.